Also, see information about A SECOND IN ETERNITY, my book about a life-changing 'out-of-body, near death' experience I had in 1977: http://garywimmer.com/writer/eternity.htm. 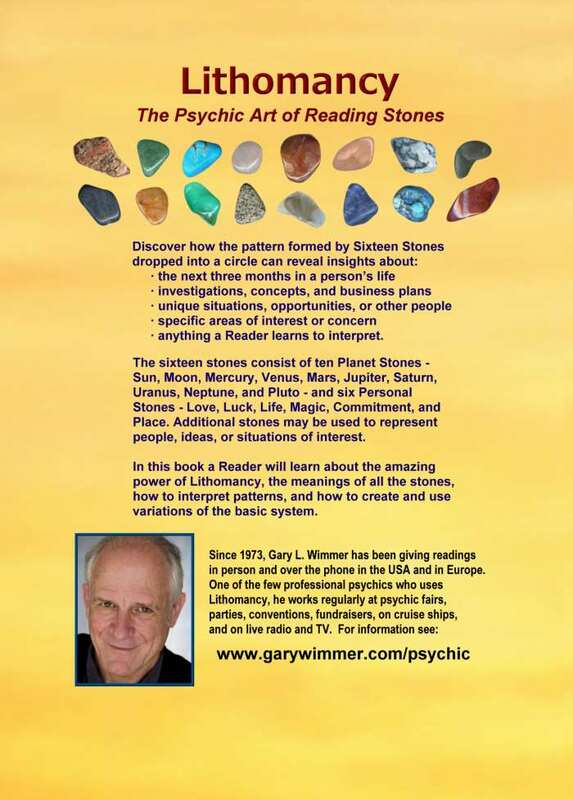 I have been giving psychic readings since 1973 using various systems, and since 1980 using Lithomancy, a method of reading patterns formed by stones. For detailed information about my history with Lithomancy, how I give readings, what I see, what to expect, etc. click on Gary L. Wimmer, Master of Lithomancy. To purchase the book and/or see the trailer or selected pages, click on the links above. 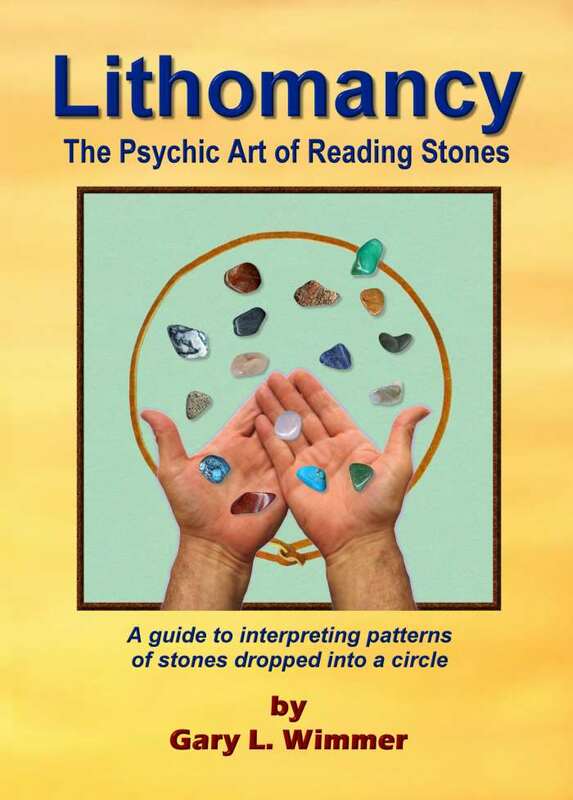 Lithomancy, the Psychic Art of Reading Stones (55,000 words), the only comprehensive book on Lithomancy, empowers the reader to understand different ways to interpret meaning from the Pattern formed by Sixteen Stones dropped or tossed into a Circle (which represents the environment) of leather, lace, or similar material. This book explains the basic system and variations to it, and inspires an individual to develop a personalized system of Lithomancy. It contains 24 pictures and detailed descriptions of all sixteen Planet and Personal Stones. The material is broken down into five chapters. Chapter 1 explores the relationships between religion, spirituality, and psychic phenomena, and touches on some of the clouded and mysterious history of Lithomancy. Chapter 2 explains in detail the meanings of the Six Personal Stones and the Ten Planet Stones in terms of their astrological associations. Using this knowledge, a Reader will compile an overall understanding of the influences of each Stone. 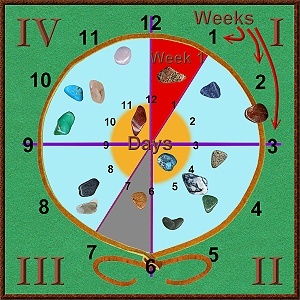 Chapter 3 explains different ways to interpret Patterns and Clusters of Stones, and how to read the timing of Events over the next three months. In this chapter, a Reader will learn to grasp the meaning of a Pattern from a geometric point of view, and to combine that knowledge with natural intuition to give readings. This chapter also reveals numerous ways a Reader can develop a personalized system of interpretation. Chapter 4 offers insights about attitudes, preparation, and techniques a Reader should use to be effective, and makes suggestions about how Readers can develop psychically and enhance their intuitive skills. Chapter 5 explains why I began to explore psychic phenomena and how I learned Lithomancy. Pictures in the Amazon book are in grayscale, as color is expensive to print. On newer Kindle devices, all pictures in the Kindle version are in color. The Six Personal Stones represent personal issues: Life, Luck, Love, Commitment, Magic and Place. The Ten Planet Stones represent the ten planets and their astrological associations: the Sun, the Moon, Mercury, Venus, Mars, Jupiter, Saturn, Uranus, Neptune and Pluto. The Sun and the Moon are considered planets in astrology. This basic system of Lithomancy covers a period of three months or longer, though a Reader can make adaptations and read for longer or shorter time periods. To make use of this art, a Reader should first become familiar with the meanings, influences and attributes associated with each Stone. The Reader then needs to learn various ways of ‘seeing’ Patterns in terms of the relationships between the Stones, the flow of energies, and the timing and sequence of events, people, experiences, situations, etc. The Pattern formed by the Sixteen Stones visually and symbolically represents the Subject’s life and present situation, as well as the most likely possibilities and events that will unfold over the next three months or so. It is up to the Reader to interpret meaning, and this ability is attained through intuition and experience. Lithomancy is not an exact science. It is a learned art, and as with any art, skill develops with practice. There are no hard and fast rules, only guidelines and suggestions. As a result, every Reader will invariably develop a personalized system, tailored to his or her own personality, basic nature, and psychic perspective. A Reader can then apply variations and personal adaptations to this method in order to read for people other than the Subject, different situations or alternate time frames. Simply put, effective divination depends on a Reader’s ability to ‘see’ the relationships between Stones and interpret meaning. The terms ‘keywords’ and ‘trigger’ (or ‘triggers,’ used as both a noun and a verb) will be used in the following sections. A trigger is indeed what the term implies: a stimulus that causes, initiates, or actuates (triggers) something else to happen. A trigger can be a smell, a sound, a person, an object, an observation, a thought, or just about anything. Seeing a photo from the past, hearing a certain phrase spoken, or returning to a particular place can act as a trigger by stirring up a tide of emotions, thoughts or memories that can bring other issues to one’s attention. Common themes are associated with each Planet or Personal Stone, resulting in the lists of keywords for each Stone. By becoming familiar with these keywords, a Reader can acquire an overall view of the influences attributed to each Stone. Collectively, keywords form a unified frame of reference, like a psychic database, that is accessible via intuition rather than memory. The art of Lithomancy can be broken down into two aspects: the visual and the intuitive. The visual aspect is displayed by the Pattern formed by the Stones. The intuitive aspect involves interpreting meaning from the Stones and the Pattern. The first step is to learn what each Stone represents, which is the subject of this chapter. To interpret meaning the Reader applies intuition to ‘see’ and ‘feel’ the meaning behind the geometric layout of the Stones. In this method of Lithomancy, the Circle represents the Environment of the Subject of the reading. This Circle can be formed using a strip of leather, lace, string or similar material about three to four feet in length with a knot near the ends. This material should be placed on a cloth on a soft surface and spread out evenly in all directions. A Circle about twelve to fourteen inches in diameter works best in that it allows ample space for the Stones to land without forming a tight pile in the center. Clusters are groups or piles of Stones that land on or close to each other and are thus linked by proximity. Clusters may overlap, and a Stone or more in one Cluster may also be seen as a part of another Cluster. There are no precise rules regarding how far apart Stones can be, yet still be regarded as a Cluster. Since my Stones are enlarged in these Pictures, just about every Stone can be seen as forming some Cluster or another. I will use the term Cluster when referring to and focusing on a particular set of closely interrelated Stones. A Reader may see other Clusters in these Pictures, but I may not refer to them. By practicing this art, a Reader will learn to recognize Clusters and how to interpret them. Pointers are edges, tips or other characteristics of a Stone that point in a particular direction or in different directions. Most of the Pointers in my Stones (or most stones that are not round) are obvious; others are less clearly defined and subtler. 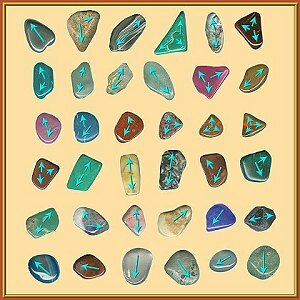 Pointers can be relevant in an overall Pattern and its smaller Clusters because they can imply direction and flow of energies, power, influence and/or connections to other Stones. Not all the Pointers in my Stones feel significant in many readings, but in just about every reading the Pointers on a few Stones feel highly significant. There are, of course, numerous possible connections between Stones and directions a Pointer can point, as well as many different ways to read and interpret a Pattern. Like others aspect of the reading process, the significance of Stones and their Pointers becomes truly apparent only when a Reader applies intuition, the most important aspect of the interpretation process, in context with an actual reading for a Subject. Stones form all kinds of fascinating and revealing arrangements. Study the picture below for a moment. Notice that there is a Cluster in each Quadrant of this Pattern. Let’s examine these in detail. 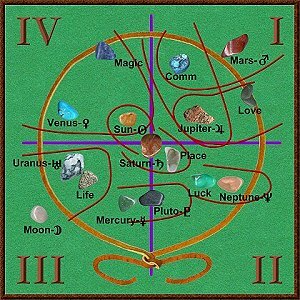 Quadrant I: The Luck, Uranus and Love Stones form a Cluster. From a geometric point of view all three Stones connect to each other via their Pointers and their proximity to each other. The Uranus Stone seems to wedge itself between the Love and Luck Stones. From this perspective, perhaps this trio of Stones indicates changes (or other Events associated with Uranus) in love and luck. Another possible interpretation would be that the Love Stone links Uranus and Luck, perhaps implying that love or a loved one acts as a bridge between Events associated with the Uranus and Luck Stones. 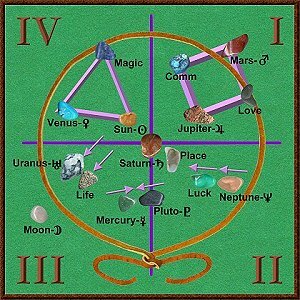 One might also interpret the Luck Stone as bringing luck to the Uranus and Love Stones. In fact, all three interpretations (as well as many others) can be valid and reveal insight. By using each of the three Stones as a different reference point, a Reader can get an even more detailed picture of what this Cluster and each Stone within it represents. As you can see, just from a geometric point of view this simple Cluster of three Stones can imply many possibilities, depending upon which Stone or Stones a Reader uses as a reference point. Quadrant II: The Magic, Place and Pluto Stones project outward (as I interpret my Pointers) from the Moon Stone. This could imply that female issues, emotions, the subconscious or other Events associated with the Moon Stone are at the core of this particular Cluster, and that the Moon is acting as a force affecting the Events of the Magic, Place and Pluto Stones. Or perhaps these Stones are affecting the Moon Stone, pulling its energy in all directions. The Magic Stone (timing) seems to point backwards, perhaps implying that the Subject may be looking to the past to understand timing issues between Week 3 and Week 4, or into the future. The Pluto Stone seems to point to both the Moon Stone and the future (forward). Maybe some personal or subconscious struggle from the past (Pluto) is a barrier that a mother (Moon) or the Subject has to deal with on an emotional level and evolve beyond. Quadrant III: The Stones in this Cluster form a circle. Circles represent harmonious systems in which different parts work together in a cohesive nature, as in an atom, a wheel, a solar system, or a galaxy. As such, the Events associated with all five of these Stones seem to reinforce each other. The Life and Sun Stones (both being positive and powerful) connect with the Neptune Stone (spirituality, dreams), then with the Venus Stone (balance, art, love) and finally with the Saturn Stone (lessons, wisdom, restrictions). I started with the Life and Sun Stones because they are closer to the center. A Reader may find one of the other Stones to be a more relevant point from which to start interpreting this cluster. From any starting point, however, this circle does look unified and potent, emphasized by the harmony of Venus, the wisdom of Saturn, the power of Life and the Sun, and the spiritual perspectives of Neptune. Imagine how you might interpret this Cluster if all the Pointers extended outward, like a star, rather than towards the adjacent stone. A different feel? A different meaning? 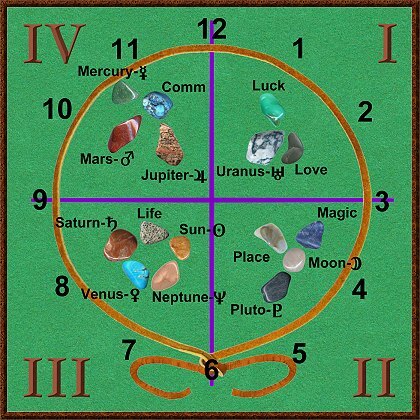 Quadrant IV: Here we find the Mercury, Mars and Jupiter Stones point inward and towards the Commitment Stone, as opposed to outward and away from the Moon Stone as in the Cluster in Quadrant II. The Commitment Stone seems positively influenced and/or supported by the expansive nature of Jupiter, the communication and intellectual skills of Mercury and the force and determination of Mars. My Mars Stone has white stripes on one end, and I usually see this as defining the direction of Mars energy. For that reason, Mars could also be applying pressure on the Commitment Stone. Travel (Mercury) may be a factor in this Cluster. Overall, the geometry of this Cluster does seem to indicate many strong influences at work, perhaps benefiting the Commitment Stone the most. Still, each Stone can be interpreted individually or in context with other Stones in this Cluster or in the Pattern. Each point of reference can render insight from a different perspective and concerning a different issue. Information about Alice Worrall, the gifted psychic who taught me Lithomancy.